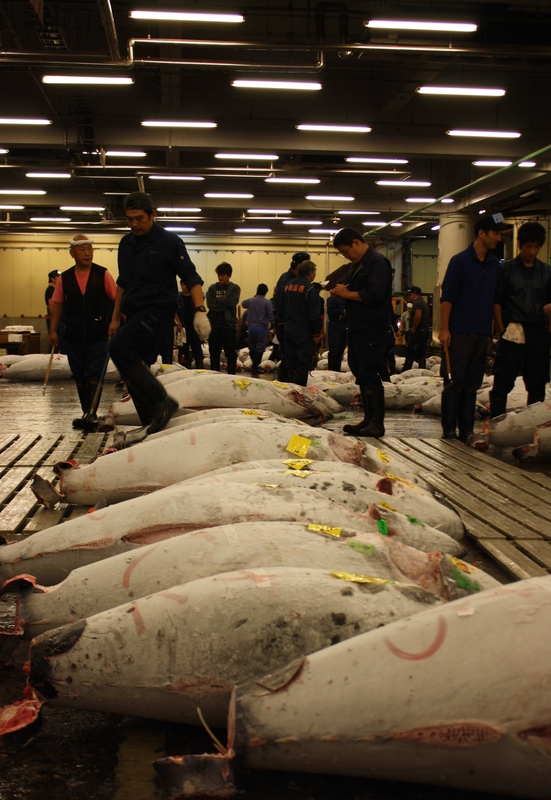 We decided that a trip to the Tsukiji fish market’s tuna auction was a must-see while we were in Tokyo – despite needing a 4am start, it proved to be a great plan. 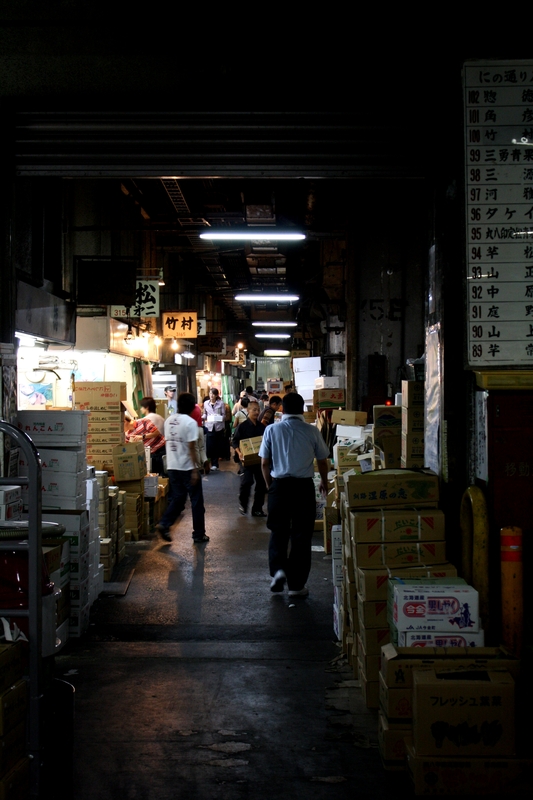 The market handles 2000 tons of seafood a day, which requires a huge amount of manpower – inside and around the market area was extremely busy, it was just about as hustly and bustly as you can imagine. At 5am the atmosphere was energetic and lively, with huge amounts of activity along all the stalls from fishmongers preparing the seafood to laborers carrying huge crates of unbelievably fresh catches to and fro. Ben got run over by a man on a fork-lift type thing on the way to the tuna auction. The Tuna auction was the main focus of most tourists visits to the markets (including ours) and was the only part even vaguely catering for tourists presence at all. Apparently after some trouble a few years ago, tourists in the tuna auction are now confined to a viewing area (a very small roped off area through the middle of the auction rooms with the tuna laid out on either side). The Tuna themselves were extremely impressive, I’d never imagined that they could be so big (I’d assumed they were cylindrical, Metal-skinned and had sunflower-oil blood). 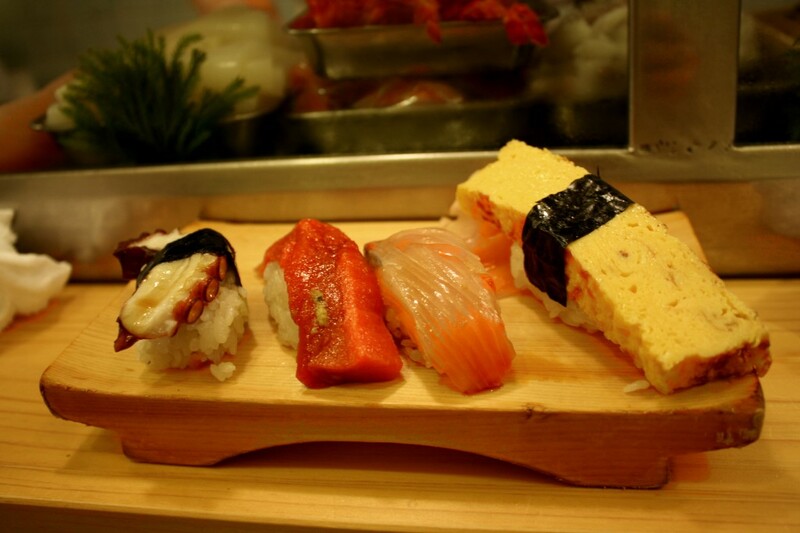 I chose octopus, tuna, hamachi and omlette nigirizushi (left to right above). Extremely fresh, a pretty great way to start a day.